The latest addition to the LF of America facility is the new bellows filling system – an automatic filling and capping machine for bellow bottles. Rather than depending completely on contract filling and packaging services, many products are now instead packaged at a company’s own facility. This new bellows filling system, named the Bellow Bottle Machine, is a practical solution for companies interested in having their own automatic filling and capping machines onsite for faster distribution times and long-term cost-reduction. The Bellow Bottle is a diversely functional plastic container primarily used for liquid serums, creams, and can even be modified for powders. It comes with different options to choose for cannula sizes (choose between short or long) and container size (ranges between 3 mL up to 9 mL). Other custom design options for the Bellow Bottle container includes choosing between a variety of colors for its caps and applicators. The Bellow Bottle Machine itself is an efficient bellows filling system that makes automatic capping and filling containers quick and easy. It can be modified to automatically fill a more than sufficient amount of different containers and has a full-size production capacity that maxes out at 1,500 units per hour (or 25 units per minute). 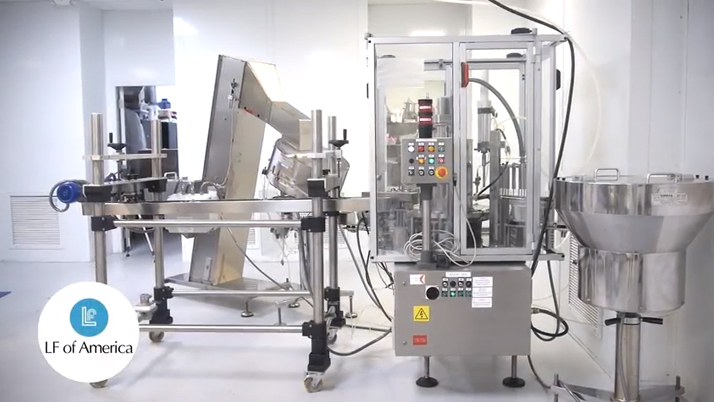 This high volume production level is as efficient as any automatic filling and capping machines, making our Bellow Bottle Machine the ultimate innovative packaging solution. By separating the caps from the containers and keeping them on opposite ends, the bellows filling system uses a piston filling process to fill the product into the container first. Once filled, the containers are aligned for capping and then, once capped, loaded onto a conveyor. Once on the conveyor, the bottom of the bellow bottles (or other containers) can then be coded, preparing them for retail or widespread distribution. Like all our contract filling and sealing machines, the new Bellow Bottle Machine is housed in an ISO-8 cleanroom. This ensures that each filling machine remains in total compliance with FDA regulations, even when stored and not in use. Additionally, our own Bellow Bottle Machine has already been responsible for filling several million units in-house and is one reason why LF of America continues to be an industry leader in the contract filling and packaging community. If you have any additional questions or wish to discuss pricing for the Bellow Bottles Machine or any of our contract filling and sealing machines, contact a member of our team. We pride ourselves on our ability to help companies find the perfect packaging solution to take their business to the next level and share a passion for providing exceptional customer service to each and every client we help. Check us out on social media for more news, navigate our website for more information on our services, or call 561-988-0303 for other inquiries.